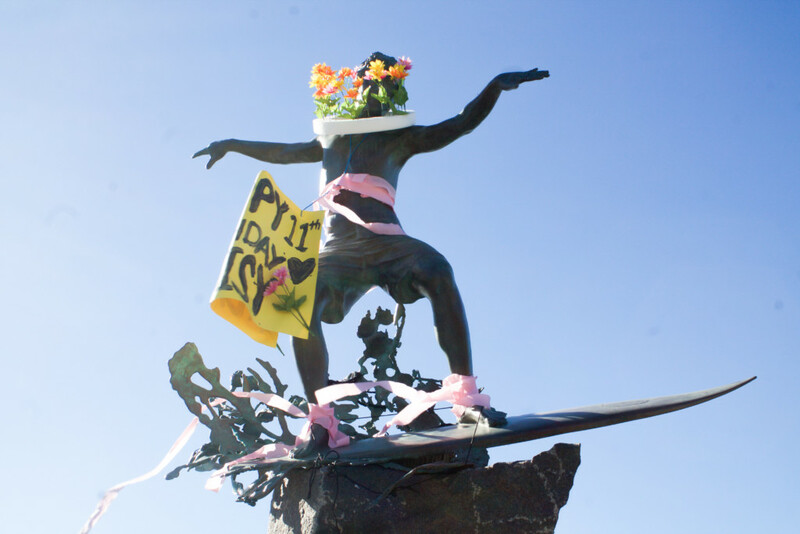 The bronze sculpture depicting a surfing boy elicited howls of outrage when first unveiled in 2007 on South Coast Highway 101. Surfers said the stance and hands were all wrong. The boy looked silly. It offended their sense of what it meant to be a cool surfer shredding waves with proper form. But over time, the mockery of what was officially named “Magic Carpet Ride” morphed into a form of local enjoyment and even pride. The Kook has worn pink for breast-cancer awareness and been dressed as everything from Zorro to Vincent Van Gogh to Alice in Wonderland. He’s survived the tentacles of a kraken and the talons of a pterodactyl, represented sports rivalries and political stances, issued wedding and prom proposals, had an annual run named after him and calendars sold in his honor. While “kook” typically refers to an eccentric person, it’s also a slang name that surfers apply to a wannabe or dorky surfer. As an example, Phalen mentioned the UGG boots she wears over her wetsuit in winter. “Gotta own it,” she reiterated with a smile. Matthew Antichevich, who lives in Hemet and teaches in the art department of Mt. San Jacinto College, received a $92,000 commission from the Cardiff Botanical Society to create the sculpture. The city of Encinitas funded the installation of “Magic Carpet Ride” for an additional $30,000. The sculpture is located on the west side of Highway 101 at Chesterfield Drive, with the San Elijo State Beach campground forming the background. 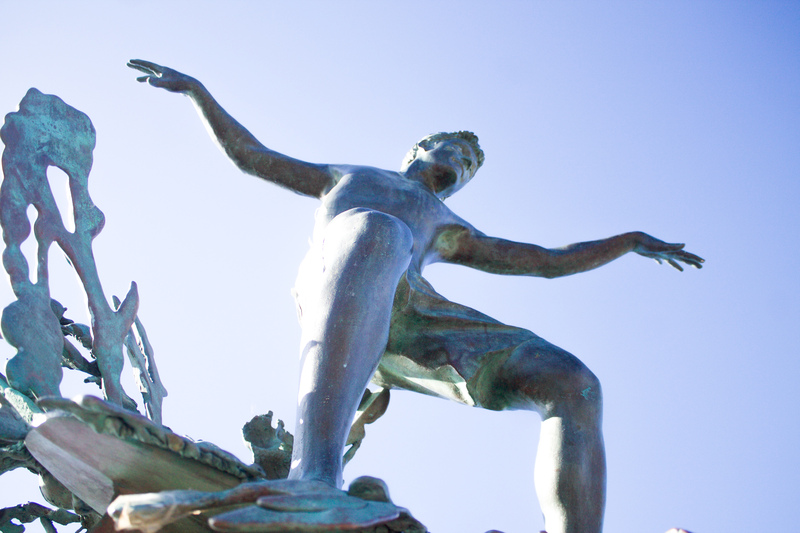 According to various sources, the botanical society ultimately wanted the statue to be of a boy learning to surf. The idea of a female surfer was floated but rejected. The sculpture’s model was Kevin Holldber, a family friend of Antichevich who learned to surf at the very beach the statue stands before. Interestingly, Antichevich also learned to surf in Cardiff as a child. While it is technically illegal to dress up the statue — and some pranksters have received letters warning them of vandalism charges should they choose to continue such behavior — the city does not generally police the sculpture or apply a very heavy hand when it comes to the Kook’s costumes. The sculpture has been damaged and repaired as a result of the seemingly endless decorations, however. 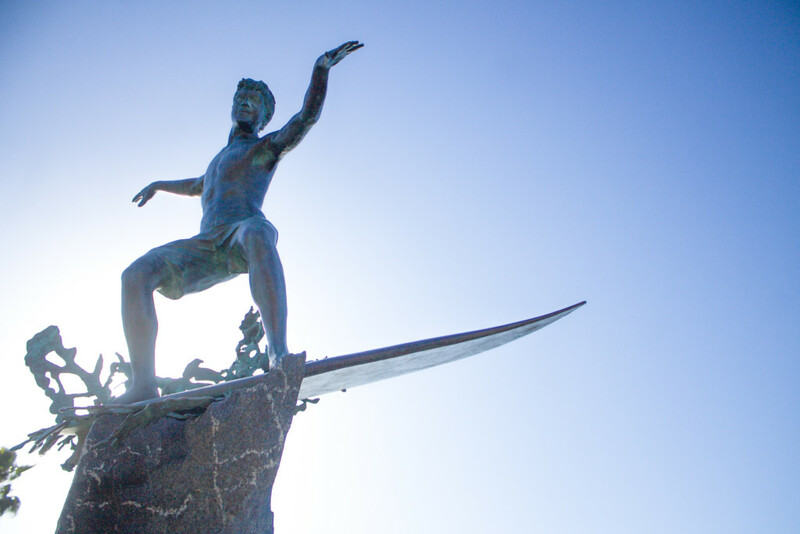 Parts of the bronze surf spray by the boy’s surfboard have been broken before by people using them to climb onto the sculpture, while the granite base has been marred by tape and scratched by wires. Attention, apparently, can take its toll. But the statue has brought attention to the Cardiff area in a way that’s unique and mostly playful, highlighting residents’ creative expression. I live within walking distance of the Kook.I remember when it first went up. I thought it looked silly. It wasn’t a boy or a girl. Rumor had it that it was supposed to be a surfer girl, but a local high profile citizen didn’t want a girl, so that was that. Over the years the Kook has taken on a life of it’s own. A local citizen, Fred Caldwell, does a calendar each year of the many designs the Kook has worn. The best, in my opinion, was the Shark! The pterodactyl, was also awesome. No matter how the Kook dresses there will be people who love or hate it. Since I live so close, I walk to the Kook every day just to see what the statue is wearing. I am disappointed when it is just the Kook san outfit. It looks so “naked”. It has become one of the many tourist attractions in Cardiff. I have often talked to non-residents about how it came to be. Just another one of the many stories in Cardiff-by-the-Sea.